Wiken, Ed. "Natural Regions". The Canadian Encyclopedia, 04 March 2015, Historica Canada. https://www.thecanadianencyclopedia.ca/en/article/natural-regions. Accessed 25 April 2019. The Rockies extend 1200 km from the American borders of BC and Alberta to the Liard River Basin (Corel Professional Photos). Canada's taiga is dominated by a relatively few cold-tolerant conifers (Corel Professional Photos). Typical boreal shield country in northern Ontario (photo by Brian Milne/First Light). A piece of ice that has become detached from its parent glacier by a process known as calving (photo by Mike Boedel/courtesy Govt of NWT). Different processes can produce distinct ice forms in the atmosphere or on or below the Earth's surface (Corel Professional Photos). 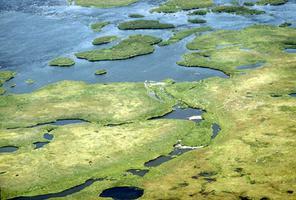 Aerial view of islands & Hudson Bay below (courtesy Canadian Tourism Commission & Ocean Images). The terrain around Ramsey Lakes, Manitoba is typical of aspen parkland, depicting samphire along the rocky shore, fescue grassland and aspen woodland. The region is part of the largest remaining block of aspen parkland left in the world. Most of the original parkland has been converted to cropland (photo by Cleve Wershler, courtesy Cottonwood Consultants Ltd.). Cooking Lake at Elk Island Park. The area is typical of the poplar woodland region (photo by Cliff Wallace, courtesy Cottonwood Consultants Ltd.). 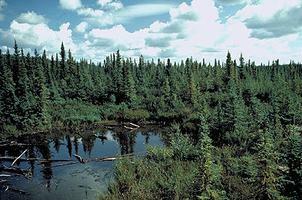 Muskeg at Old Crow Flats (photo by I.K. MacNeil, courtesy Parks Canada). The Old Crow Plain is covered with a myriad of small lakes (photo by I.K. MacNeil, courtesy Parks Canada). 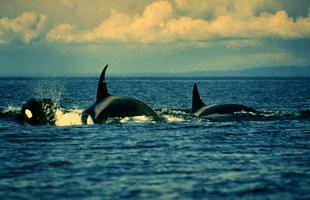 Orca whales at sea (courtesy Masterfile). Tundra in the Southern Arctic Region of the NWT (photo by Tim Fitzharris). The Atlantic Maritime region extends from the mouth of the St Lawrence River across New Brunswick and into Nova Scotia and PEI. 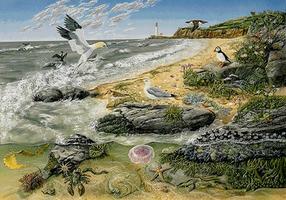 The ocean has a major impact on this zone and its wildlife (artwork by Claire Tremblay). This ecozone is the only major mountainous region of Canada outside the Rockies. 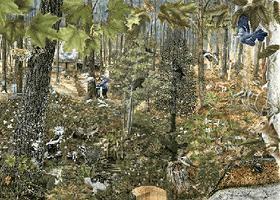 At lower elevations, bedrock and debris cover the slopes and valley bottoms (artwork by Autumn Downey). 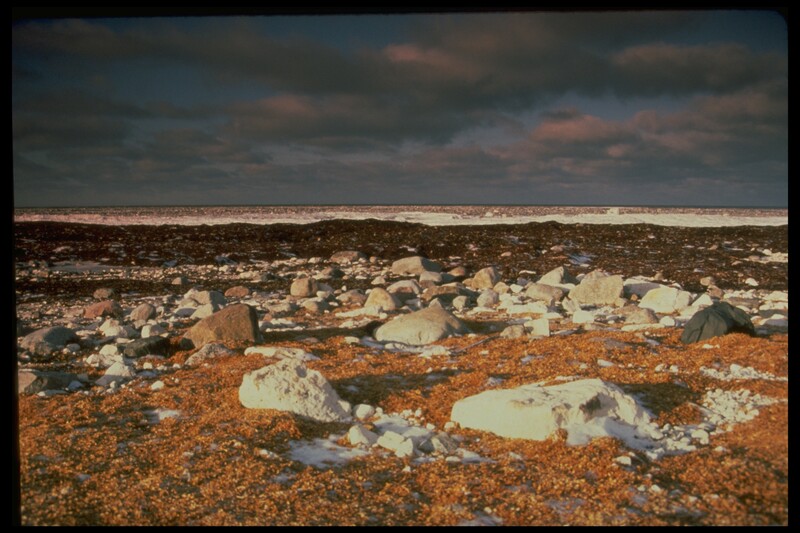 Because most of Devon Island is a plateau, it is a barren landscape, dominated by frost-shattered rocks (Corel Professional Photos). This satellite photo shows different ice formations around Melville Island, NWT. The dark areas are first-year ice, the lighter multilayered ice. The jagged fracture lines are also visible (courtesy Canada Centre for Remote Sensing). Tombstone Mountains, Yukon Territory (photo by Tim Fitzharris). Moresby Island on the northern edge of Canada's West Coast (photo by Tim Fitzharris). In this fragile alpine environment, vegetation changes as the altitude increases. At a certain level trees no longer survive, although a wide variety of flowers is seen. 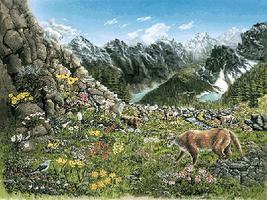 The animals that live in the ecosystem are the cougar and elk (right), bighorn sheep and bear (centre), mountain goat (upper left) and numerous birds (artwork by Claire Tremblay). The complex forest ecosystem supports many life forms. The grove is part of the Mixed Forest region and includes both deciduous (eg maple, on the left) and coniferous (centre, with the bear cub) (artwork by Claire Tremblay). The biggest acreage of British Columbia vineyards is in the dry but protected Okanagan (courtesy British Columbia Wine Institute). The topography of the Lowlands is the result of weathering and erosion by rivers of the nearby flat-lying early sedimentary rock (photo by Thomas Kitchin). This ecozone consists of rolling plains and is dominated by shrubs, herbs and wetland species. 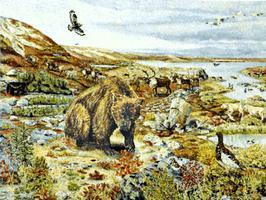 Mammals include muskox, wolf, arctic fox and bears (artwork by Autumn Downey). Plants with deep roots, such as trees, grow here with difficulty because the soil is permanently frozen. Mammals here include Dall's sheep, caribou, moose, bear and pika (artwork by Autumn Downey). 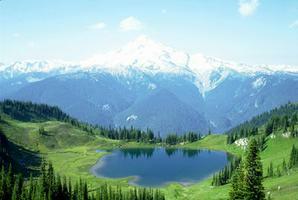 This ecosystem is very mountainous, often interrupted by plateaus (Corel Professional Photos). Natural regions are intended to describe areas of the Earth's surface which possess similar qualities or attributes. They may refer to either land or water, and can vary in size. 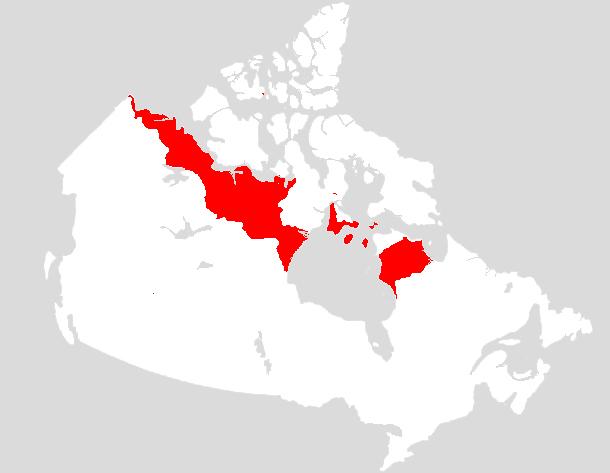 The term “natural region” is often used interchangeably with the word “ecozone.” Canada has 20 natural regions (15 terrestrial and five marine). Natural regions, or ecozones, include descriptions of an area’s living organisms as well as its physical environment. Living organisms may include plants, animals, insects and bacteria, while the physical environment encompasses rocks, soils, climate and water. The boundary lines between ecozones are often areas of transition where one set of ecozone characteristics gradually merges into another set. The transition between the treed boreal ecozones and the arctic ecozones, for example, may take place over tens of kilometres. Ecozones represent large ecosystems and are useful for gaining a perspective on the nation as a whole. However, they can be further subdivided into smaller subsystems which have increasing significance at the provincial and local levels. 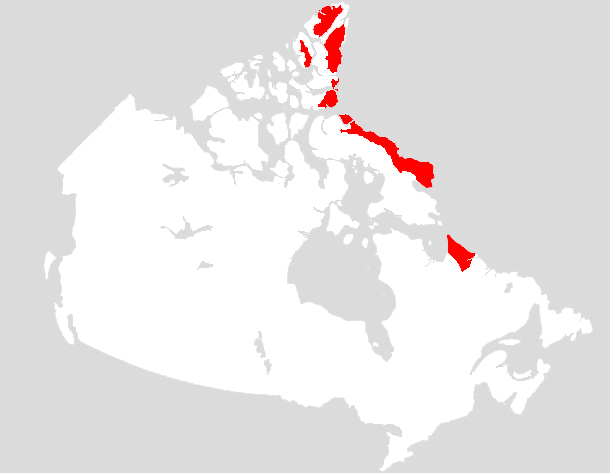 The Northern Arctic ecozone extends over most of the Arctic Islands and includes the northeastern portion of the Northwest Territories, most of Nunavut and parts of northern Québec. This area occupies about 15 per cent of Canada, or just over 1.5 million km2. In the global circumpolar setting, this ecozone constitutes the largest arctic archipelago. Hundreds of islands — as massive as Baffin Island and as small as Garnet Island — give this area a special character. Calcareous soils and bedrock along with the dry, cold climate can combine to create very harsh and desert-like conditions in some areas. This greatly limits plant growth and, in turn, habitat for animals. Unfortunately, the desert-like areas are where many of the main communities (e.g., Resolute, Cambridge Bay and Arctic Bay) are located. Beyond the desert-like sections there are wetland oases and other productive landscapes. Most of this ecozone is associated with the most extensive set of islands in the entire circumpolar Arctic area. The islands and mainland associated with this unit consist of mostly plains and rolling hills. Many of the plains are coastal lowlands that merge with ocean waters. However, on Devon Island, and the Brodeur and Borden peninsulas, steeply-sided coastal cliffs of 200 to 300 m separate land from water. The plains and hills are perched several hundred metres above the ocean surface. The Brodeur Plateau is vast and seemingly uninterrupted for over 300 km, and is dissected, very much like the southern badlands, with mesas and painted canyons. Much of this area is covered by deposits of glacial moraine. The resulting soils are frozen year-round except for thin surface layers that thaw in the brief summer period. The ground surface is often "patterned" with various forms of vivid stripes or circles. These are indications of how the landscape is subject to the churning caused by repeated freezing and thawing cycles. Lakes and ponds are not common and occupy less than one per cent of the surface. The climate is very cold and, surprisingly, very dry. The annual precipitation averages from 100 to 250 mm — the lowest in Canada. In some areas where there is influence from nearby mountains, the precipitation can reach 500 mm, as in the Labrador area. The average growing season ranges from less than 125 to 250 growing degree days (GDD) above 5°C. Summers are short and cool as the mean daily temperatures only rise above freezing in July and August. Winters experience daily temperatures that average less than -30°C. The ground has continuous permafrost and thaws only to shallow depths in the summer. Beyond the traditional mineral soils, the ground may contain massive ice lenses tens of metres thick. Because of the severe climate, vegetation is commonly ground-hugging and dwarf-like in form. Vegetation abundance and ground cover differs significantly throughout the area. In landscapes where calcareous soils are prevalent, the plant cover and types of species are typically limited. Where the soil material is derived from shales or sandstones, the cover and types of species are better. The poorly- drained lowlands and wetlands normally provide the most diverse and rich sites for plants. 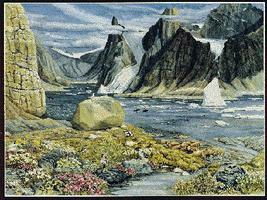 The number of plant species in the Arctic is generally low, about 150. The main vegetation in upland areas consists of lichens and herbs, whereas wetter lowland sites will be predominated by sedges and mosses. Plants such as purple saxifrage, mountain avens, arctic poppy, crustose lichens, cotton grass, arctic willow, moss campion, sedges, arctic lousewart, white heather and willow are common. Fewer than 10 per cent of all of Canada's species of mammals are found here. Mammals of the Northern Arctic ecozone include Peary caribou, muskoxen, wolf, arctic fox, polar bear, arctic hare and collared lemmings. Birds include red-throated loon, brant, oldsquaw, gyrfalcon, ptarmigan, jaeger, snowy owl, snow geese and snow bunting. 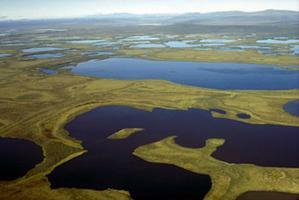 The waterfowl, in particular, rely on the Arctic wetlands and small lakes as key breeding and nesting grounds during the summer period. They often migrate great distances to the south to winter. In the nearby marine environment, typical species include walrus (in the east), seals (bearded, harp and harbour), beluga whales and narwhal. Reptiles and amphibians are absent, while insects such as mosquitoes abound. Hunting, fishing and trapping remain activities for local residents in this ecozone, most of whom are Inuit. Several mines have been successful ventures. As the Arctic has nearly 60 per cent of Canada's estimated oil resources and 50 per cent of the potential gas resources, various oil and gas activities have been active in the area. 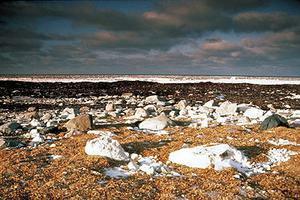 National parks like Aulavik on Banks Island and Auyuittuq on Baffin Island attest to the area's beauty. Settlements include Cambridge Bay, Cape Dorset, Pangnirtung and Iqaluit. This ecozone only covers 2.5 per cent (250,590 km2) of Canada though it is part of a larger ecosystem extending into Greenland. Glaciers, ice caps and mountains reign supreme. The Arctic Cordillera ecozone contains the only major mountainous region of Canada outside the western mountain system known as the Rockies. It provides an eastern spine to the Arctic, occupying most of Ellesmere and Axel Heiberg Islands, as well as the eastern edges of Devon, Bylot and Baffin Islands, and parts of northern Labrador. In profile, this ecozone is like a layered cake. Its lower edges start at the coastline of Baffin Bay and Davis Strait, rise upwards through fjord-dominated landscapes and merge at higher elevations (i.e., 1,200 to 1,800 m) with ice-masked summits and rocky peaks. 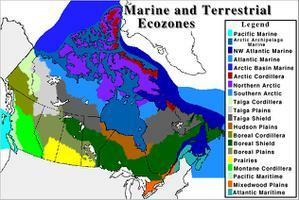 During the glacial period, much of Canada would have looked like this ecozone. The area is masked by deep covers of ice and snow throughout the year. The main landforms are mountains. The terrain has marked relief (as is typical of fjord-dominated areas) and elevations (reaching over 2,000 m). The tops of the mountains, however, are often mantled by ice caps towards the northern parts and by glaciers in the southern parts. In combination, the ice and mountains provide some of Canada's most captivating scenery. Along Baffin Island, many glaciers are seemingly anchored to mountain peaks. These rivers of ice spread outwards from the peaks like roots on a tree, slowly crawling down through the valleys. Sometimes the glaciers extend to the foot of the mountains and into the ocean. Ice caps have their own majesty and form. They appear to be flat and dome-shaped mounds covering the higher elevations. While the Barnes Ice Cap is in the middle of Baffin Island, the majority of the famous ice caps — Devon Island, Ellsemere Island and Grise Fjord — are north of Lancaster Sound. At lower elevations, bedrock and the debris from frost-shattered rock covers the foot-slopes of the mountains. Soils are formed mainly in the few narrow valley bottoms. These valleys are the only locations where plants thrive to any degree and some habitat is provided for animals. Long, narrow U-shaped valleys are common features of the fjord coastline. The climate is very cold and arid. Very few people live here and climate stations are few in numbers and often located at low elevations. Precipitation is estimated to be only 200–300 mm per year. The annual growing season ranges from 0 to 125 growing degree days (GDD). As in many of the Arctic ecozones, the summer period in which the mean average temperature is above freezing is brief (July and August mainly), but the periods of daylight are extremely long. In the northern reaches of this ecozone, the average annual temperature is below -19.7°C. Ice and rock prevent the establishment of plants over the majority of the area. The mountain peaks are devoid of vegetation because of the ice and snow. The lower mountain slopes provide some vegetation cover, and this markedly increases in the narrow confines of fjord-carved valleys. Mostly lichens, low-growing shrubs, sedges and herbs prevail. Examples include crustose lichens, purple saxifrage, mountain avens, cottongrass, willows, moss campion and arctic heather. With little vegetation, this ecozone has few animals. Polar bears roam the coastal areas. Birds include northern fulmar, common-ringed plover, hoary redpoll and snow bunting. Thick-billed murres, black guillemots and Iceland gulls are common sea birds. Walrus, seals and whales (narwhal, beluga and killer) live in coastal waters. Hunting, trapping and fishing activities support subsistence economies. Coastal communities like Pond Inlet, Clyde River and Qikiqtarjuaq are examples of larger communities. These local communities have a collective population of just over a 1,000 people and constitute one of the world’s least populated areas. The tourism industry continues to develop. 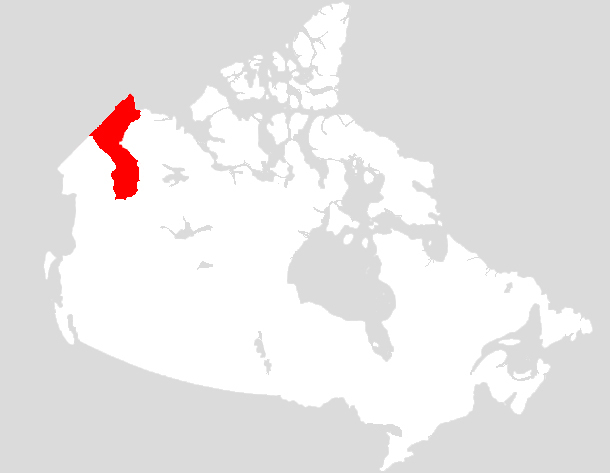 The Southern Arctic ecozone is largely restricted to the mainland and spans both sides of Hudson Bay. 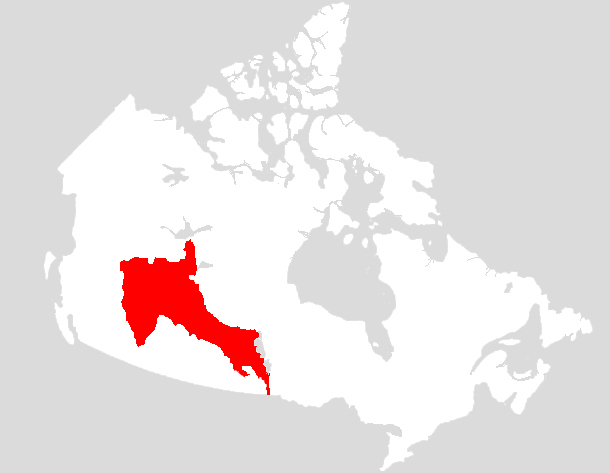 Over three-quarters of this ecozone is on the western side of the bay in the northern parts of the Northwest Territories and Nunavut. The eastern extension covers sections of northern Québec, roughly north of Fort Chimo. Just over eight per cent (832,390 km2) of Canada's land mass is contained in this ecozone. The land consists largely of rolling plains along with some hills. The plains are of varied kinds, including coastal plains and drumlinized plains (i.e., areas dominated by cigar-shaped mounds whose alignment marks the path of former glaciers). Some of the drumlins along the upper Back River are nearly flat and others west of Chantrey Inlet are among the most dramatic in Canada. 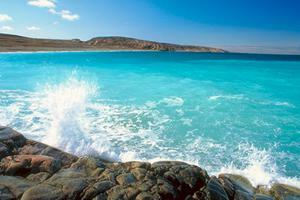 Besides deposits of moraine, there are large areas of marine deposits. Throughout the area some bedrock may be exposed. Soils are frozen and only thaw to shallow to medium depths in the summer. Frost boils and patterned ground attest to the action of frost. The underlying frozen ground acts as a barrier and prevents soils from readily draining. Waterlogged and damp soils are common. Small lakes are numerous and are important for waterfowl and fish habitat. Easterly flowing rivers such as the Thelon and Back have played an important part in history and are currently used for canoeing and wilderness adventures. The region experiences long, cold winters and short, cool summers. The summer period is about three to four months. The annual precipitation varies from 200 to 400 mm north to south. The average annual growing season ranges from 250 to 750 GDD. The Southern Arctic ecozone is where many of the more typical Arctic features begin to respond to the warmer temperatures and extended growing seasons. While the area is dominated by shrubs, herbs and wetland species, there is a fair range in the size of shrubs. Near the poleward limits of trees to the south, the sizes of the shrubs vary from a metre and decrease to heights of a few centimetres toward the northern edge. Typical shrubs include dwarf birch, willows, Labrador tea and heath. These are mixed with various herbs and lichens. Mosses and sedges become key species in wetland areas. Mammals of the ecozone include muskox, wolf, arctic fox, grizzly and polar bears, arctic hare, arctic ground squirrel and lemmings. 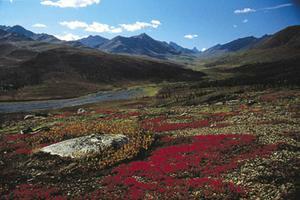 Most strikingly, the area is the major summer and calving grounds for the barren ground caribou. Nearly a million caribou migrate here including the Qaminirjuaq, Beverly, Bathurst, Bluenose and Porcupine herds of the territories, and the Leaf and George River herds of northern Québec and Labrador. Some moose are seen but they tend to hug the southern margins of this ecozone. The area is also an important breeding and nesting ground for a variety of ducks. It provides habitat for loons, whistling swan, snow goose, gyrfalcon, willow and rock ptarmigan, jaeger, snowy owl and snow bunting. The arctic coast is home to walrus and seals (grey, harp, bearded, harbour and ringed). Whales (beluga, narwhal, sperm and northern bottlenosed) are also typical marine species. Hunting and trapping are the main activities on land. The area is known for its mineral wealth, and exploration for new sources continues. Some operations related to petroleum reserves are present. Main settlements include places such as Baker Lake, Rankin Inlet and Tuktoyaktuk. Taiga is derived from a Russian word that generally refers to very open and stick-like forests. This ecozone is small — just under three per cent of Canada, or 264,840 km2 — and lies along the northern portion of the Rocky Mountains. 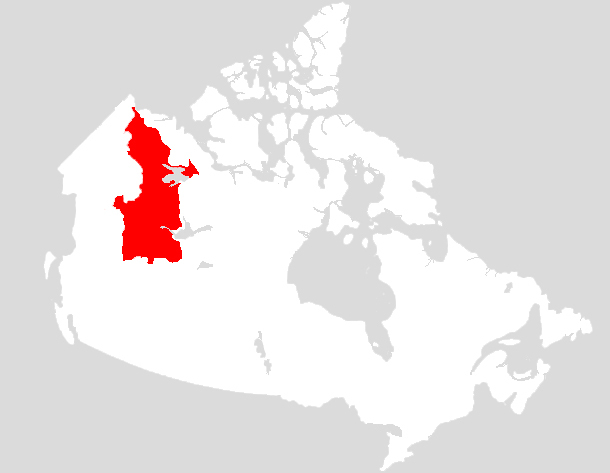 It covers parts of the Yukon and the southwestern part of the Mackenzie District in the Northwest Territories. Many of the landforms here are striking in appearance and often resemble the table-top mountains and cuestas (i.e., ramp-like mountain formations) found in the desert areas of distant New Mexico or Arizona. Being relatively untouched by ice-scouring activities of the last Ice Age, it is well known as a "refugia" for many plants. The region has high relief. It consists of rugged areas like the stark White Mountains in the northern Yukon. Other mountainous forms like buttes (cylindrical-like forms) and mesas (flat-topped mountains with steep sides) are found here. The valleys that separate mountainous ridges and ranges can be very broad. Soils are generally frozen throughout most of the year and thaw to moderate depths in the summer. The occurrence of permafrost throughout the landscape is variable and therefore, is considered to be discontinuous. While this area is largely rugged, the Old Crow Plain is an exception. 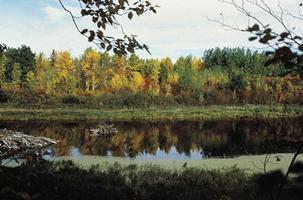 Lying north of the Porcupine River, it is an extensive plain comprised mainly of wetlands. Much of its notoriety comes from the many naturally-occurring square-to-rectangular lakes that cover the vast expanse of flatlands. The area is very dry. Contrary to popular belief, the North receives little snow. Total precipitation averages only about 300 mm per year. Winters are long and cold, with short daylight hours. Summers are warm to cool with long periods of daylight. The average growing season is about 70 GDD, but frost can occur on any day of the year. It is uncommon in Canada to see mountain ranges that are not covered to a large extent by trees. Plants with deep roots, such as trees, cannot easily grow here because the soil beneath the surface is often permanently frozen. The ground is typically covered by lichens, mosses, low shrubs, herbs and sedges. When present, trees are of low stature. They tend to be restricted to warmer spots and southern latitudes. The mammals that live in the area include Dall's sheep, woodland and barren-ground caribou, moose, mountain goat, black and grizzly bears, wolf, marten, lynx, arctic ground squirrel, American pika, hoary marmot and brown lemming. This area also contains Canada's most numerous population of wolverine. Millions of birds come north to nest in places like Old Crow Plain. Their nesting grounds are fairly safe in this remote area, and there are abundant insects for food. Waterfowl include canvasback, snow goose and mallard. Most birds fly south when the weather turns frigid. Only a few, such as the ptarmigan, brave the winter. The taiga is fairly fragile. Vegetation is easily destroyed by vehicles and can take decades to grow back. It takes special measures to build on the taiga because of permafrost. Man-made constructions such as pipelines or roads must use special designs over the years to prevent the disruption of habitat, as well as wildlife migration routes. Much of this area remains a wilderness. Most activities are confined to hunting, trapping, tourism and outdoor recreation. Some mining has taken place. Old Crow is the main settlement. The total population of this area is only a few hundred people. 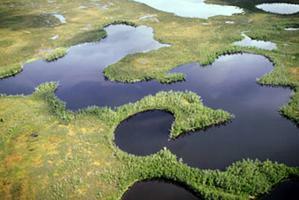 The Taiga Plains are located mainly on the western side of the Northwest Territories. 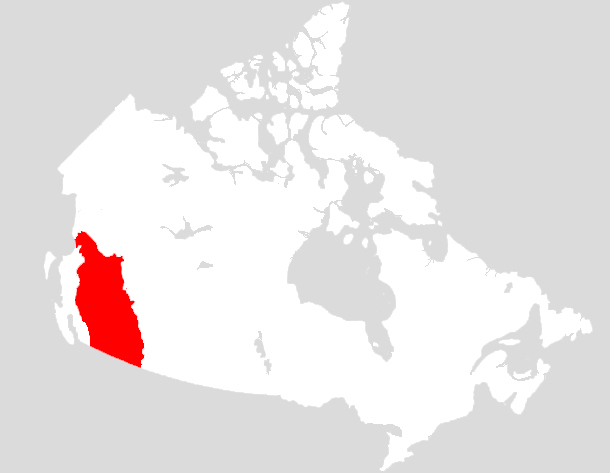 They also extend into northeastern British Columbia and the upper margin of Alberta. A large percentage of this ecozone is covered by wetlands. 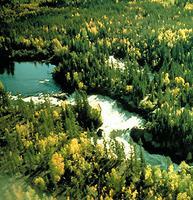 Just over six per cent of Canada's landscape (570,000 km2) is covered by the Taiga Plains. Most of this ecozone is a level or gently rolling plain, and has a discontinuous pattern of permafrost. In the summer period, soils thaw to moderate depths. The flatness and underlying permafrost impedes the drainage of surface waters. Many of the soils remain wet and become waterlogged. Low-lying depressions are where organic soils and wetlands form. The climate is semi-arid and cold. Annual precipitation is about 400 mm per year in the south to about 200 mm in the north. The average growing season ranges from 1,000 GDD in the south to about 750 GDD in the north. Winters are long and cold. The poorly drained areas are covered with moss, sedge, dwarf birch, Labrador Tea, willows and Bearberry. The uplands tend to be better drained and support a mixed forest of black and white spruce, larch, white birch, trembling aspen, balsam poplar and lodgepole pine. Mammals of the Taiga Plains include moose, woodland caribou, bison, wolf, black bear, marten, lynx and arctic ground squirrel. Bird species include red-throated loon, northern shrike, sharp-tailed grouse, fox sparrow and common redpoll. The main activities on the Taiga Plains are hunting and trapping. Some mining and oil and gas activities take place. Fort Nelson, Hay River and Fort Smith are some of the communities in the area. As the name of the Taiga Shield implies, this landscape (nearly 14 per cent of Canada, or about 1.4 million km2) is associated with the Canadian Shield rock formations. Rock outcrops, stick-like forests and a large number of lakes are key features of this ecozone. It lies on both sides of Hudson Bay. 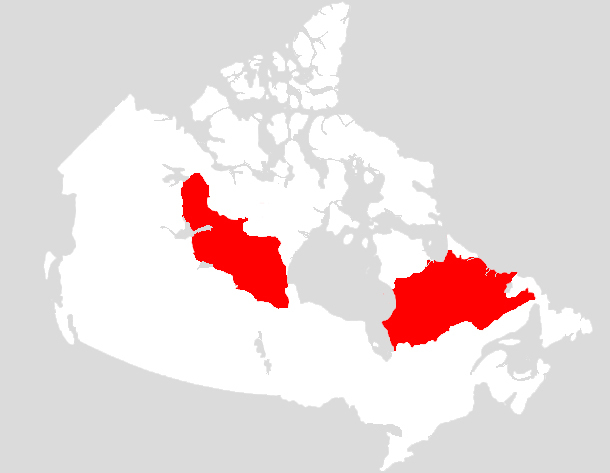 The eastern segment occupies central Québec and Labrador, while the western segment occupies parts of northern Manitoba and Saskatchewan, and lower parts of the Northwest Territories and Nunavut. Most of this ecozone consists of extensive areas of rolling hills and plains. During the last continental glaciation, the Canadian Shield was scoured by ice, leaving outcrops of bare rock and thin mantles of glacial debris. The extent of permafrost in the ground is variable — widespread in some spots and scanty in others. The frozen ground often prevents the soils from draining. Consequently, the areas in depressions are commonly waterlogged. 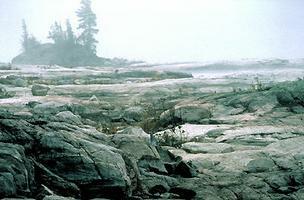 The major fracture patterns in the bedrock and scoured out depressions are natural areas for lakes to form. The terrain is dotted with numerous lakes and ponds. The water bodies provide habitat for many waterfowl and fish species. The climate is subarctic continental, with low precipitation (from 175 to 200 mm annually). Temperatures are cool to cold. The average growing season ranges from 500 GDD in the north to 1,000 GDD in the south. Summers are short with prolonged periods of daylight. Winters are the reverse. The northern edge of this ecozone represents the treeline (i.e., the limit where trees can grow). The forest stands are open and mixed with areas of arctic tundra vegetation. Stunted black spruce, alder, willow and larch are the most common trees. In Québec these trees are mixed with white spruce and balsam fir. Common mammals of the Taiga Shield include barren-ground and woodland caribou, moose, wolf, snowshoe hare, arctic fox, black and grizzly bears, and lynx. Birds include arctic and red-throated loons, northern shrike, American tree sparrow and grey-cheeked thrush. This ecozone is generally unproductive for commercial forestry. Recreation and tourism activities exist. Yellowknife, Labrador City and Churchill Falls are some of the communities. (353,364 km2) of the nation's land mass, this ecozone is one of the least known and least visited areas of Canada. It contains the largest single area of wetlands in the country and some say the largest in the world. This coastal plain on the southern end of Hudson Bay is covered with terrain commonly termed muskeg or marshes. The vast majority of the area lies in northern Ontario, but it extends along the coast into Manitoba and Québec. Overall, this ecozone is a flat coastal plain. The origins of the soils that cover the plain have two main sources. Some materials originated from old lake-bottom deposits (lacustrine) and others were derived from former sea-bottom deposits. In both cases, they tend to be fine-textured silts and clays. In many parts of the Arctic and Hudson Bay waters, the coastal areas are still rebounding from the weight of massive glaciers that once covered the country during the last glacial period of 7–10,000 years ago. The Hudson Bay lowlands show dramatic evidence of this through the pattern of beachlines or strandlines. Almost parallel to the current-day beach and coast there are a series of low-relief ridges that mark the historical location of former coastlines. These beach ridges are widely spaced and extend several kilometres inland. The soils are often wet and composed of organic matter. Canada is well known for its wetlands and the habitat it provides to waterfowl. This ecozone is heavily influenced by the cold and moist air that comes in from the Arctic and Hudson Bay. Precipitation is from 400 to 700 mm per year. The average growing season ranges from 500 to 1,000 GDD. Because of poor drainage and accumulating organic debris, the soils are acidic and of the wetland type. The vegetation is like much of the taiga, except in this ecozone wetlands reign. Various species of sedges and mosses dominate the wetlands areas. On drier locations like the beach ridges, lichens and herbs, and ground-hugging shrubs take over, and further inland or in sheltered spots open woodlands of black spruce and larch exist. The ecozone is a major habitat for waterfowl, especially the Canada goose. Millions of birds use this ecozone in the summer as nesting and rearing habitats. Along the northern margins of this unit polar bear, walrus, ringed and harbour seals, along with beluga and bowhead whales can be seen. Mammals more typical of the inland include woodland caribou, moose, black bear, marten, arctic fox and fisher. In the very early periods when Europeans first explored the North American continent, the coast of Hudson Bay was the site of many forts. These served as gateways for the explorers and trappers that ventured into the heartland of the boreal forests and prairies to the south and east. The ecozone lacks many of the resources (timber and minerals) that usually support larger northern communities. The wetlands and coastal areas generally support activities like hunting, tourism and trapping. Settlements such as Churchill and Moosonee are within the region. 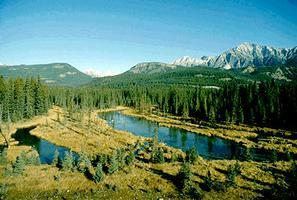 The Boreal Cordillera ecozone is located in the upper midsection of the Rocky Mountains. 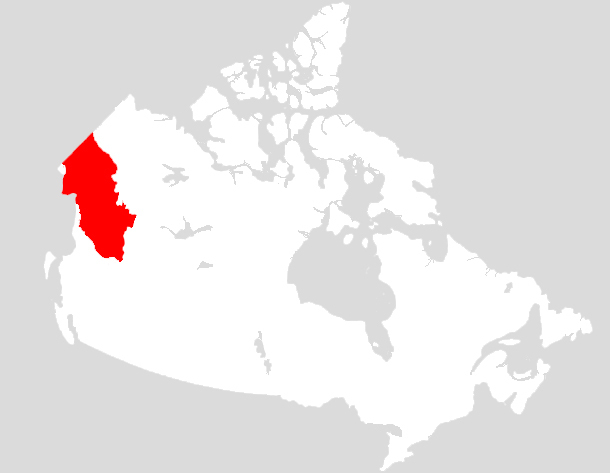 It covers sections of northern British Columbia and the southern Yukon, and amounts to nearly five per cent of Canada’s land mass (464,600 km2). Unlike the other Boreal ecozones which cover various parts of Canada's interior lowlands, this unit is in the mountainous uplands. While it is largely forested, this area has some portions which are alpine. The landscape is mountainous. 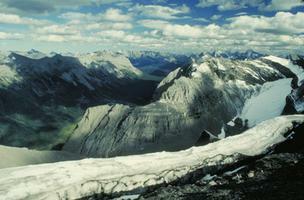 It includes sections of well-known mountain ranges like the Mackenzie and Selwynn ranges. Some of Canada's highest peaks are located in this zone. The mountain ranges can be interrupted by broad valleys and plains sometimes referred to as plateaus. As in most mountainous settings, there is a mixture of materials covering the surface. At high elevations, barren rock may predominate. On the upper reaches of the mountain slopes, colluvial (i.e., broken rock fragments and debris which falls down-slope) material is predominant. In the valleys, the paths of former glaciers have left widespread deposits of moraine. Soil types follow a similar pattern, being nonexistent on mountain ridges and becoming forested soils (i.e., Brunisols) in the valleys. The climate in a mountainous area can be variable. The summits experience the harshest conditions, and lower valley reaches are the most moderated. The winters in general, however, are long and cold, and the summers are short and cool. The average precipitation and temperature are generally higher in the Boreal than in the Taiga. In this region precipitation is much higher on the mountains in the west, which receive from 500 mm at lower elevations to over 1,000 mm per year above treeline. The eastern areas are in a "rain shadow," and receive only about 400 mm per year. The average growing season ranges from about 750–1,500 GDD. The types of vegetation respond mainly to patterns in soils and climate. Naturally, then, vegetation follows a layered order. In the lower elevations where soil and climate conditions are less challenging, conifers like white spruce are the dominant trees, with variable amounts of black spruce, lodgepole pine and trembling aspen mixed in depending on site conditions. 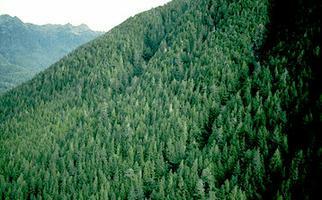 Subalpine fir replaces white spruce as elevations become higher. These species are well adapted to the long, cold winters. The appearance of stunted forest species represents conditions where trees have extreme difficulty in growing. Subalpine fir, Englemann spruce and other trees take on twisted and dwarf-like forms. 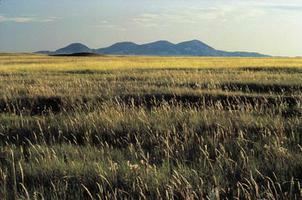 Beyond the treeline, alpine tundra communities are prevalent along many mountain ridges. 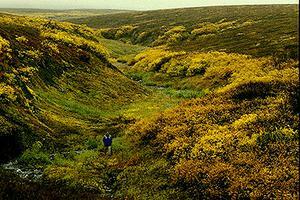 The tundra consists of sedge- and herb-covered meadows, ground-hugging shrubs and lichen-colonized rock fields. At the highest elevations bare rock, snow and ice prevail. In the Boreal ecozones, as elsewhere, more than 50 species of insects feed on the conifers, including the spruce budworm. Billions of black flies, mosquitoes and wood ticks make their home in the forests and surrounding areas, often making life miserable for wild animals as well as humans. Animal life is abundant in the boreal forest and most species thrive in the summer months. Mammals in the boreal are varied and this particular part of the boreal has several species that reflect the mountainous conditions. Woodland caribou (in the north), moose, black and grizzly bears, marten, lynx and arctic ground squirrel are some of the more common boreal species. The presence of Dall's sheep, mountain goat (in the south), hoary marmot and American pika are more closely associated with the alpine conditions. Birds include willow, rock and white-tailed ptarmigan, the gray jay and spruce grouse. Few birds stay the winter. This ecozone supports a forestry industry, along with mining and hydroelectric developments. It also supports many support services and industries based on tourism and recreation. Some of the communities found in the area include Whitehorse, Dawson and Haines Junction. The Boreal Plains (just over seven per cent of Canada, or 737,800 km2) extends in a wide band from the Peace River country of British Columbia to the southeastern corner of Manitoba. This is the second-largest of the Boreal ecozones. The Boreal Cordillera to the west is marked by mountainous terrain and the Boreal Shield to the east is rocky and hilly terrain. The surface topography varies from being nearly level to gently rolling. Most of these plains show clear evidence of the last glaciation. The area is mainly covered by a mixture of glacial deposits including the striated areas of moraine, old lake bed materials and some fluvial (i.e., river or stream-derived) deposits. Throughout the landscape, the depressions are occupied by small lakes and wetlands that form part of the watersheds of the Peace and Athabasca rivers. Soils are typically moderately weathered and belong to the group of soils called Brunisols and Luvisols. Soils are deep and fairly productive for tree growth. This region is one of the drier of the Boreal ecozones since it is influenced by continental climatic conditions. More precipitation falls in the Boreal Cordillera to the west. About 400 mm of precipitation per year is received in the north and 500 mm in the south. The average growing season ranges from 1,000 to 1,250 GDD. 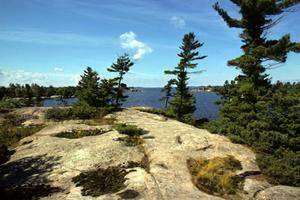 The main conifer species in upland areas are white and black spruce, and jack pine. In the wetter lowlands, tamarack is more common. There is also a wide distribution of broad-leaf species such as white birch, trembling aspen and balsam poplar. Almost one half of the ecozone is covered by productive forest land. While insects and disease affect forest stands here, fire is the most powerful agent influencing the age and distribution of forest types. Along the southern edge, there is a transition zone between the forest and the prairie, sometimes called the Aspen Parkland. Throughout the landscape, there are wetlands in which various mosses, willow shrubs, tamarack trees and other species thrive. Mammals on the Boreal Plains include moose, woodland caribou, mule deer, white-tailed deer (in the south), wapiti, black bear, marten, beaver, timber wolf, fisher, lynx, coyote and least chipmunk. Bison are mainly confined to park reserves. Birds include boreal and great horned owls, gray jay, common loon, various ducks, white-tailed sparrow, rose-breasted and evening grosbeaks, Franklin's gull and brown-headed cowbird. Walleye, northern pike and turbot and some trout inhabit the lakes and streams. The boreal forest in this ecozone supports the pulp and paper industry. Hunting and trapping activities continue to be significant. Agricultural lands have grown in extent but still occupy less than 10 per cent of the Boreal Plains. 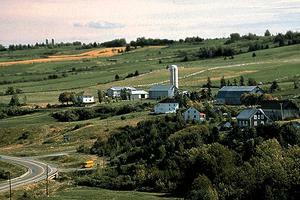 The Peace River area is the most northerly area in which extensive agriculture activities are carried out in Canada. Oil and gas exploration and hydroelectric developments have remained important industries. Grande Prairie, Dawson Creek and Hinton are some of the main settlements. 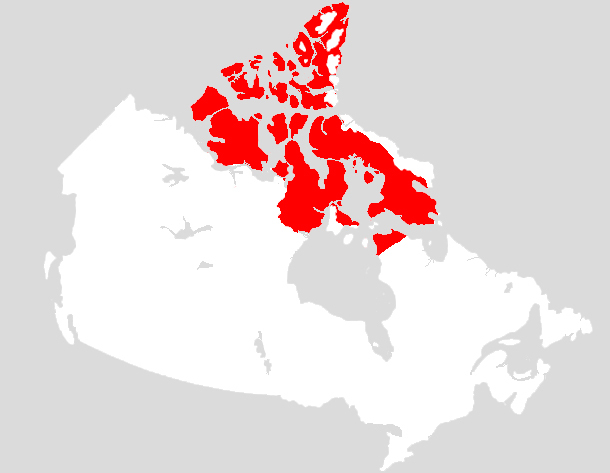 The Boreal Shield is the largest (about 20 per cent of Canada, or over 1.9 million km2) of all the ecozone units. It is broadly U-shaped and extends from northern Saskatchewan east to Newfoundland. From northern Saskatchewan it passes north of Lake Winnipeg, the Great Lakes and the St Lawrence River to Newfoundland. The rocky hills, coniferous forests and abundance of lakes are recurring parts of this well-known landscape. Like the Taiga Shield ecozone to the north, this ecozone shares many of the same landform features —hilly terrain, many rock outcrops, moraine and fluvial deposits of variable depths. The depressions and natural fracture patterns in the Canadian Shield bedrock are littered with countless lakes, ponds, wetlands, rivers and streams. Significant parts of the watersheds for the Churchill, Abitibi and Nelson rivers are contained in this ecozone. Where they occur, soils are of variable depth and often coarse-textured. The soils belong to a group (Brunisols) of moderately-weathered materials that are common in high-latitude forests. In the sense of nutrients, these soils are of moderate quality. The areas taken up by rock outcrops and shallow soils reduce the extent of productive forest land. This ecozone has long, cold winters and short, warm summers. The climate is generally continental but is influenced by cold air masses from Hudson Bay. There are relatively high levels of precipitation, from 400 mm per year in the west to 1,000 mm in the east. The average annual growing season varies from 1,000 GDD in the north to over 1,500 GDD in the south. The forests comprise hardy tree species such as black and white spruce, jack pine and balsam fir. The coarse-textured soils, rocky areas and warm summers all combine to dry forests and to make them prone to widespread fires. An aerial view of forests here can often reveal a quilt-like pattern of burned- over areas from recent burns to maturing stands. While fires can destroy valuable timber, they also have their inherent value. Fires purge old forests of insects, disease and ground debris, as well as trigger new growth of other species and provide variation in habitat. While conifers are the most predominant species, trees such as yellow birch, sugar maple and black ash start to appear in the southeastern parts of the ecozone where it merges into the Mixed Woods Plains. In areas where outcrops appear, there is a colourful array of lichens and ground-hugging shrubs. Wetland vegetation can vary from sedges, mosses, grasses and trees, depending on the wetland type. Mammals of the Boreal Shield include moose, wolf, woodland caribou, white-tailed deer, black bear, porcupine, bat, raccoon, marten, fisher, skunk, lynx, bobcat and eastern chipmunk. The ponds of the area are rich in life, including turtles, snakes, mudpuppies, frogs, salamanders and toads. Beavers, muskrats and mink use the wetlands and streams as habitat. Each spring, the abundance of waters in the ecozone attracts hundreds of thousands of ducks (American black duck, bufflehead, ring-necked duck), loons, geese and other birds. Some come to summer in the area and others use the aquatic habitats for resting spots on their journey to more northerly nesting grounds. Other bird species include the boreal owl, white-throated sparrow, the great blue heron, kingfisher and at times the turkey vulture. Fish species include lake trout and whitefish, burbot and northern pike. This region is well known for its forest, mining, hydroelectric generation and recreational resources, all important sectors within the Canadian economy. When there are many competing uses for the land, proper management and planning become crucial. Most of the forest industry of Québec and Ontario is based in the Boreal Shield. Sudbury, Chicoutimi and St John’s are some of the cities in this region. This ecozone is generally associated with the coastal mountains of British Columbia or the lands that are adjacent to the Pacific Coast. While relatively small (about two per cent of Canada or 218,980 km2), it is well known for its stately forests, spectacular mountain scenery and dramatic fjord coastline. The coastal mountain ranges are the region’s most striking feature. They are part of the Pacific Ring of Fire mountains — a semi-circle of mountainous terrain set around the Pacific Ocean and known to be prone to volcanic eruptions and earthquakes. The coastal mountains typically rise sharply from the fjords and coastlines of the Pacific Ocean and climb along steep and forested slopes to glacier-covered peaks. Mount Waddington is among the highest peaks. The main materials that cover the land surfaces tend to follow an orderly pattern. The summits comprise bare rock and ice fields, whereas the mountain slopes are mantled by colluvial debris, and the lower foot slopes and valleys have morainal and some fluvial deposits. The soils which have developed on the slopes and valleys are productive forest soils (like the Podzols). One major valley and flood plain emerges along the coast, called the Fraser River valley. This ecozone has some of Canada's warmest and wettest weather. The proximity to the warm ocean currents has a considerable effect on moderating the temperatures throughout the year. The overall area receives up to 3,000 mm of precipitation per year. Some areas in the rain shadow of the mountains and on the lower Gulf Islands may, contrastingly, receive as little as 600 mm. There is relatively little variation in monthly temperatures compared to the rest of Canada. Averages in July range from 12 to 18°C and in January between 4 to 6°C. The annual growing season is up to 2,000 GDD in the southern valleys, 1,500–1,700 GDD in the more prevalent mountainous regions. Warm temperatures throughout most of the year and heavy rainfall provide conditions that support some of Canada's most spectacular forests. In these coastal forests are some of the tallest, oldest and most productive trees in Canada. Coniferous trees grow to heights of 80–95 m. The western coastal forest is composed mainly of western red cedar, western and mountain hemlock, Douglas fir, Sitka spruce, yellow cypress and alder. Douglas fir is largely confined to the extreme southern portion of the ecozone, while Pacific silver fir is more common in the north. At higher elevations, mountain hemlock forests and, ultimately, treeless alpine communities replace the coastal forests. Although much more limited in extent, the lower Gulf Islands near Victoria and Nanaimo have the rarer Garry oak and arbutus trees. Mammals of the area include black-tailed deer, black and grizzly bears, mountain lion (cougar), fisher, raccoon and American pika. Bird species unique to this area include American black Oystercatcher, California and mountain quail, tufted puffin and chestnut-backed chickadee. Other birds include northern pygmy owl, Steller's jay, bald and golden eagles, and northwestern crow. Salmon spawn in streams throughout the ecozone. Most of the land in this ecozone supports a very productive forest industry for the saw log, and pulp and paper mills. While a small portion of this ecozone, the Fraser River Lowland and the southern tip of Vancouver Island, have rich agricultural soils, much of it has been lost to urban sprawl and development. The coastal rivers are well known for their commercial and sport fish values. It is also the main base for fleets that harvest fish in the coastal waters. 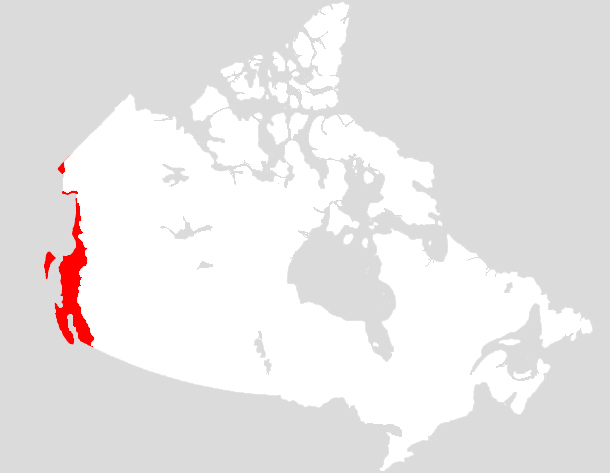 The largest city is Vancouver, and other communities include Victoria, Powell River, Prince Rupert and Ocean Falls. This largely mountainous area of southern British Columbia and southwestern Alberta contains a great variety of conditions. They form what appear to be layers, from snow-covered peaks and alpine meadows to spectacular tree-covered river valleys. The contrast provides striking scenery and supports varied land uses. 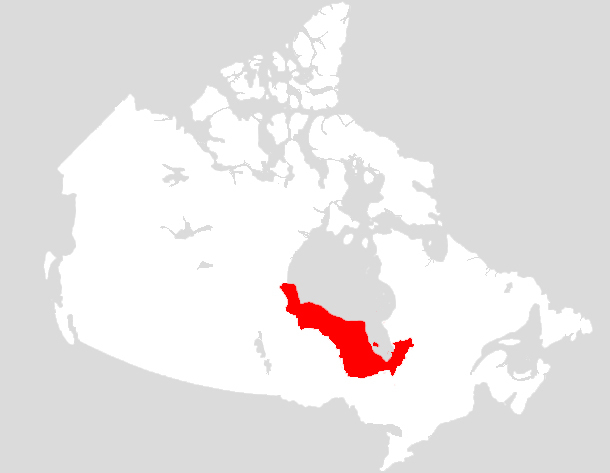 About five per cent (492,110 km2) of Canada is in this ecozone. The Rocky Mountain range comprises smaller mountain groups, including the Selkirk Mountains, Purcell Mountains and the Columbia-Monashee Mountains. Large sections of the area's most spectacular mountain scenery are preserved in local national parks such as Banff, Jasper and Wells Gray. The ridges of mountain peaks follow a northwesterly direction often mirrored by parallel valleys of great length. Because of their U-shaped form, the valleys are commonly called Rocky Mountain troughs. The 100 to 200 km Kootenay and Arrow lakes have formed in these valleys. In the northwest corner of this ecozone, the mountainous terrain becomes more subdued and the valleys broaden. Glaciation has had a substantial impact here, scouring and reconfiguring the lowlands, leaving deep mantles of moraine. The higher elevations give way to colluvial materials and then, bare rock and ice fields. The many lakes and rivers in this ecozone are important for fisheries, recreation and hydroelectric power. Large parts of the watersheds belonging to the Fraser and Columbia rivers are contained in this ecozone. The Montane Cordillera ecozone has moderately long, cold winters and short, warm summers. Annual precipitation ranges from 800 mm in the north to 2,000 mm in the south. However, in localized areas like the Okanagan Valley, the precipitation can be well below 500 mm where the local climate is hot and desert-like. The average annual growing season is up to 2,000 GDD in the south and about 1,000–1,250 GDD in the north. The vegetation in the ecozone varies according to elevation and climate. Just below the icy peaks, the vegetation is alpine. Herbs, lichens, mosses and low ground-hugging plants predominate. Forests, however, are the dominant types of vegetation throughout this ecozone. The forest belt where Englemann spruce and subalpine fir are common occurs at elevations of 1,200–2,300 m. With lower elevations and areas of fire disturbance, lodgepole pine emerges. Other species include white spruce, interior Douglas fir and western hemlock. In much more localized areas the vegetation types reflect the dry, warm climatic conditions. Ponderosa pines are indicators of such local climates, and these trees merge into adjacent grasslands and deserts. The valley bottoms of the upper Fraser, Thompson, Okanagan and Kootenay rivers are locations having these qualities. Because these areas coincide with popular recreational areas or core highway routes, the dry grasslands and desert-like plants, such as sagebrush and cactus, are seen often. The alpine areas are home to many species specially adapted to the mountain terrain. The mountain goat, with hooves like suction cups, is acrobatic and can climb to the highest peaks. Dall's sheep are also expert climbers. The cougar, which preys on these animals, is almost as adept at climbing. The American pika is unique to the subalpine area. In the forested areas, the wildlife is diverse. Common mammals of the forested areas include the moose, wapiti, mule deer, bighorn sheep, beaver, cougar, grizzly and black bears, wolf, wolverine, lynx, bobcat, coyote and badger. Typical birds include blue grouse, Steller's jay and black-billed magpie. There are major hydroelectric developments on the large rivers. Forestry is a major industry throughout much of the ecozone. 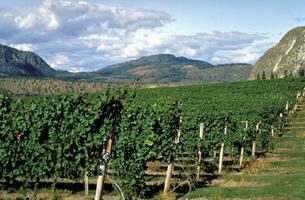 Local areas along the Fraser and Okanagan rivers support cattle ranching, orchards and vineyards. Well-known cities include Kelowna, Kamloops and Prince George. The Prairie ecozone occupies an area from south-central Alberta to southeastern Manitoba. Very little of this ecozone remains in its natural grassland state. Humans have modified more than 90 per cent of the landscape for agricultural purposes. Despite being the most extensive farmscape in Canada, it is one of the smaller ecozones (almost five per cent of Canada or 478,110 km2). The term "prairies" has almost become synonymous with the landforms that dominate the landscape, i.e., flat or rolling plains. Many of the flatter areas were once the bottom of large glacial lakes such as Lake Agassiz. Lakes Winnipeg, Manitoba and Winnipegosis are remnants of this bygone glacial lake. The "rolling" parts of the plain are more closely associated with glacial moraines. Some local areas can be hummocky and potholed, providing depressions for the establishment of wetlands, ponds and small lakes. The soils are usually referred to as grassland or Chernozemic soils. Reflecting the general precipitation patterns, they include the Brown Chernozems, which occur in the drier southern areas, through to the more productive and moister Black Chernozems in the northern parts. Underlying the surface are largely horizontal layers of sedimentary rocks. Pockets and cracks in these rocks provide natural reservoirs of oil and gas. Summers are warm and relatively short. Winters are cold and long. The prairies receive less moisture than the Boreal Plains ecozone to the north, and experience periodic droughts. The Rockies to the west, which block moisture-bearing winds from the Pacific, contribute to the dryness of this climatic regime. Precipitation ranges from more than 500 mm per year in the north to less than 300 mm in the south. The winter mean temperatures for the coldest months vary from -9.4°C in Lethbridge and -18.3°C in Winnipeg. In contrast, the mean temperature for the warmest month in Winnipeg is 19.7°C. The growing season has 1,000–1,250 GDD in the northern area to 1,900 GDD in the south. The native grasses are well adapted to drought and follow the patterns of available moisture. The short-grass prairie in the south merges into mixed-grass and then tall-grass areas as the moisture patterns improve northwards. Grasses tend to have long roots which penetrate deep into the soil where they could find moisture, though most of the native grasses have been replaced by crops. 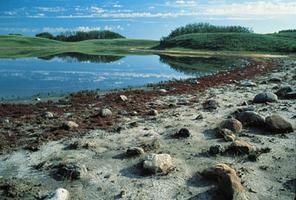 Grasslands National Park in southern Saskatchewan was established to preserve a small patch of the original grassland. The northern edge of this ecozone is dotted with groves of trembling aspen and balsam poplar. This parkland-type setting marks the beginning of the transition into forest areas. Deciduous and coniferous trees are largely absent except in sheltered locations like waterways or on higher-elevated grounds. Prior to agricultural settlement in the late 19th century, the Prairie ecozone was the home of millions of bison. Now these are confined to national parks farther north. Today, mammals of this ecozone include mule and white-tailed deer, coyote, pronghorn (south-central portion), badger, whitetail jack rabbit, Richardson's ground squirrel, northern pocket gopher and the prairie dog. Unique bird species include ferruginous hawk, greater prairie chicken, sharp-tailed grouse, American avocet, burrowing owl, great blue heron, black-billed magpie and Baltimore oriole. The ecozone is also a major breeding, staging and nesting area for waterfowl using the central North American flyway. More than half of all of the North American ducks are believed to be born in these ecozone wetlands. With agriculture being so extensive, many of the traditional habitats for animals have been lost, and species with them. 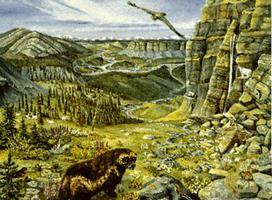 Plains grizzlies, swift fox and greater prairie chickens are examples of species that have disappeared. Habitats for species like the burrowing owl, whooping crane and piping plover are also endangered. 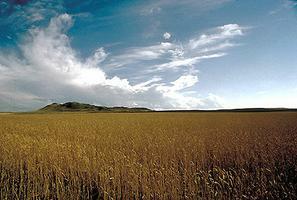 The Prairie grasslands are among the largest farming areas of the world. Their nutrient-rich soils and favourable terrain encourage a range of agricultural activities from ranching to cereal grain production. Field crops (grain, oilseeds and pulses) and forage crops occupy the greater part of cultivated areas. Crops such as canola have seen marked increases and now surpass wheat in the amount of area seeded. They also provide rangelands for livestock. 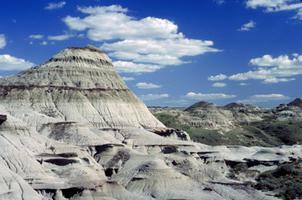 The prairies are also important for their mineral industry, particularly fossil fuels. Calgary, Saskatoon, Regina and Winnipeg are among the larger urbanized areas. 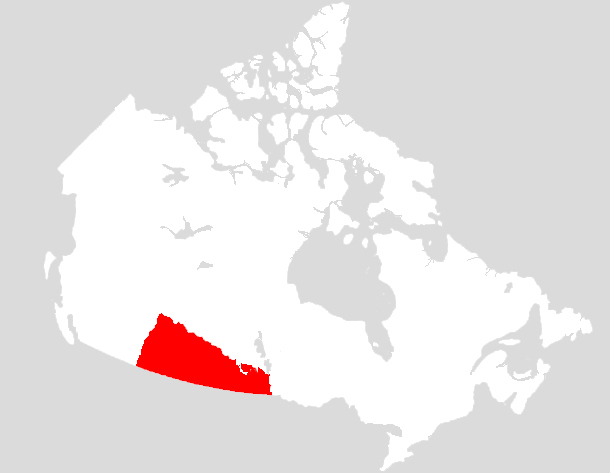 This is the most southerly and one of the smallest (two per cent of Canada, or 194,430 km2) ecozones. It is the industrial and commercial heartland of the nation. The breadth and importance of economic activities has earned this area the title of being the golden triangle. It is an area with a warm growing season and productive soils. It is the most intensely used and the most populated area of Canada. Most of this ecozone is a nearly level or gently rolling plain. During glacial times (about 9,000 years ago), much of it was once the bottom of the ancient Champlain Sea. The thick deposits of clay in southeastern Ontario and southwestern Québec are indicators of where this bygone sea stood. The more rolling aspects of the terrain in this ecozone are associated with the deposits of moraines. The undulating nature of the landscape often is the result of drumlin formations — a series of cigar-shaped mounds lined up in the direction of the movement of the glacial ice sheets. Soils are usually forest soils (Brunisols and Luvisols), but much of the landscape has long since been converted to agricultural and urban uses. 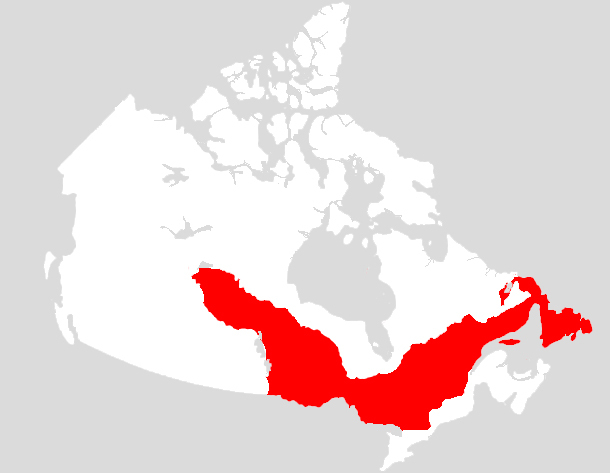 It contains four of the Great Lakes (Huron, Erie, St Clair and Ontario) as well as Georgian Bay. The lakes are important shipping corridors and recreation centres. The climate in this region is continental and marked by warm summers and cool winters. The weather is highly changeable because the ecozone is situated along one of the major storm tracks of North America. Precipitation ranges from 720 to 1,000 mm per year. The annual growing season ranges from 1,750 GDD in the north to 2,500 GDD in the south. At one time, this ecozone was heavily forested. Little of the original forest remains today. Less than 10 per cent is now forested and much of this comprises isolated pockets. The mixed forest area included species such as eastern white pine, eastern hemlock, yellow birch, red pine, sugar maple, red oak and basswood. Deciduous trees are more common in the southerly portion of this ecozone. The remnants of the deciduous Carolinian forest region are home to unique species. Unlike conifers, deciduous trees lose their leaves in the fall. This produces the splendid show of colour familiar to most Canadians. The warm climate and the extensive amount of soils supports more species of trees than any other ecozone of Canada. The area's most beautiful trees are the hardwoods: walnut, oak, maple and hickory. Dutch elm disease, which was brought to Canada in 1944, destroyed many of the stately elm trees that once lined city streets throughout Ontario. The rarest trees in Canada — such as sassafras, tulip tree, sycamore and cucumber trees — are native to the southernmost tip of this region. The large mammals, such as white-tailed deer and black bear, once abundant in this area, have largely disappeared. Smaller mammals such as black and grey squirrels, raccoons, skunks, voles and groundhog, remain fairly common. Bird species such as the blue jay, whip-poor-will, Baltimore oriole and red-headed woodpecker are common in urban green space areas. Other species such as the cardinal, Carolina wren and green heron are unique to this area. The Great Lakes are home to many species. Lake trout, whitefish and sturgeon once dominated bottom-dwelling species. Commercial fishing concentrates on rainbow smelt, white perch and common carp. The Great Lakes have been the site of various exotic and largely unwanted species such as the sea lamprey and zebra mussel. The rich soils of this ecozone have been widely used for agriculture. Most of the forested areas have been cleared away for farms, orchards, highways and cities. Cities including Toronto, Hamilton and Montréal. 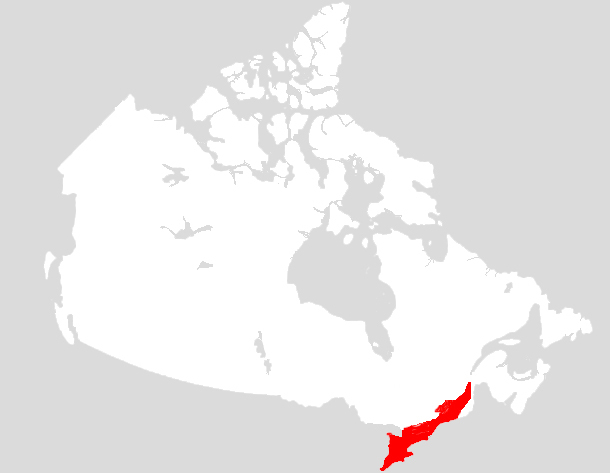 The Atlantic Maritime ecozone (two per cent of Canada, or 203,750 km2) extends from the mouth of the St Lawrence River across New Brunswick, and into Nova Scotia and Prince Edward Island. The Gulf of St Lawrence, Bay of Fundy and Atlantic Ocean have greatly influenced the character and economy of the area. The area consists mainly of uplands and hills — terrain features which dominate New Brunswick and Nova Scotia. The hills are the worn-down remains of an ancient mountain chain called the Appalachians. The coastline is a cluster of peninsulas and islands. 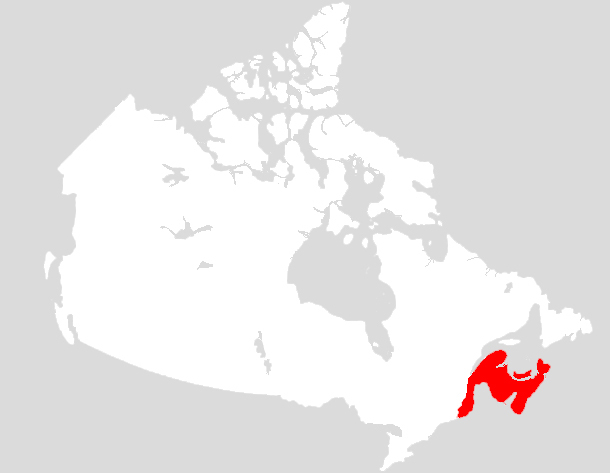 Parts of PEI and local valleys on the mainland consist of coastal plains. The hills often have exposed rock formations and, more typically, are mantled by glacial moraine deposits. Nearer the coast, the soils are deeper and are usually derived from marine deposits. Forest soils (Podzols and Luvisols) are typical. The Atlantic Ocean has a moderating influence on the climate, which is cool and moist. Winters are mild and the summers are cool. Precipitation ranges from 1,000 mm inland to 1,425 mm along the coast. The average growing season ranges from 1,500 to 1,750 GDD. During the late spring and early summer, the mixing of the cold Labrador Current and the warm Gulf Stream produces large quantities of sea fog, which spreads over coastal areas. More than 70 per cent of the land area is forested. Most of the vegetation here is associated with the Acadian forest. The coastal fringe is noted for extensive areas of stunted balsam fir and spruce. The salt spray tends to limit and deform the growth of trees. 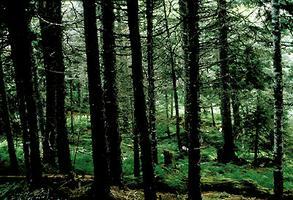 Mixed forests cover the relatively shallow soils of the uplands with red spruce, eastern hemlock, white pine, balsam fir, yellow birch, beech and sugar maple. While not common, lowland valleys such as the Annapolis Lowlands can become sheltered from direct coastal influences. Under such protection, the warmer conditions create spots where orchards can thrive. Common mammals include white-tailed deer, moose, black bear, raccoon, striped skunk, bobcat, flying squirrel, coyote and eastern chipmunk. Upland birds include whip-poor-will, blue jay, eastern bluebird and rose-breasted grosbeak. Loons, Canada geese and freshwater ducks (blue-winged teal, ring-neck ducks) are among more than 20 species that use the numerous lakes and ponds that dot the landscape. Forestry is the major activity in the uplands, while agriculture is more common in local valleys and coastal lowlands. The beauty, history and variety of coastal landscapes all combine to give this area a unique flavour. It is popular for tourism and recreation. Commercial fisheries are also important. Most of the population and all the agriculture are confined to the less abundant coastal plains. Halifax, Moncton and Charlottetown are examples of larger communities. This ecozone encompasses the Gulf of St Lawrence, Grand Banks, Bay of Fundy and the ocean waters off Nova Scotia. The continental shelf extends beyond 400 km in places and covers the Grand Banks. Waters are relatively shallow, being less than 200 m deep over broad areas. The Bay of Fundy experiences tidal ranges of up to 16 m, while tidal ranges elsewhere in the ecozone average 1 to 2 m. The smallest tides occur in the southwestern part of the Gulf of St Lawrence, where the average range is less than one metre. The waters are generally temperate, being influenced by the northward-flowing coastal current and, further offshore, the Gulf Stream. Essentially ice-free conditions are found in localized areas around the Bay of Fundy (except for the upper reaches) and along the mainland coast of Nova Scotia. However, seasonal ice can be plentiful in parts of the Gulf of St Lawrence and Cabot Strait. 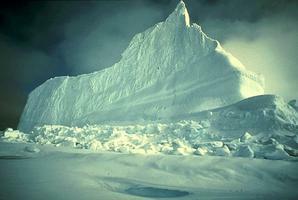 In the late winter and early spring icebergs occur off the Newfoundland coast to the Grand Banks. On the Grand Banks, the Labrador Current and Gulf Stream converge and produce one of the most productive marine areas in the world. Major fish populations include flounder, plaice, capelin, turbot, mackerel, herring, silver hake and halibut. Breeding colonies for several species of marine birds are also found here. Among these are great and double-crested cormorant, Atlantic puffin, common and thick-billed murre, black guillemot and razorbill. Common marine mammals are seals (harp, hooded and grey), whales (northern bottlenose, blue, beluga, Atlantic pilot, minke and humpback), harbour porpoises and dolphins. This ecozone has traditionally supported the country’s most important fisheries, the economic mainstay of Atlantic Canada. Precipitous declines in groundfish stocks, particularly cod, led to drastic cutbacks in the fishing and fish-processing industries. This ecozone maintains higher temperatures than the two Arctic marine ecozones (Arctic Archipelago, Arctic Basin). Just as in the Pacific Marine ecozone, it is a transitional area between polar waters and the more southerly temperate waters. There is more than a 20°C difference in temperature between the polar waters and waters under the influence of the Gulf Stream around the Scotian Shelf. Ice begins to form off northern Labrador in November–December and moves slowly south, reaching the Grand Banks in February–March. Because of the danger of collisions with icebergs, sailors know these waters as "Iceberg Alley." Clearing begins in May, and the Labrador Coast is ice-free in mid-July. 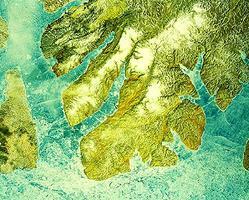 Much of the continental coastline is characterized by glacially eroded fjords, and there are over 400,000 coastal islands. The marine waters are influenced by the south-flowing Labrador Current, which transports cold water from the north. This current mixes with the warmer Gulf Stream Current around the Grand Banks. The continental shelf supports a wide range of marine mammals. Twenty-two species of whales occur off Canada's Atlantic coast, as well as six species of seals. Concentrations of humpback, bluefin and minke whales are typical in this ecozone. Killer whales, porpoises and dolphins are less common. Sperm whales are found offshore. Seabird colonies include storm-petrels, cormorants and thick-billed murres. Common fish include halibut, cod, redfish and plaice near shore. In this marine ecozone, the ocean waters are of a rather unusual type. They thread themselves around an extensive matrix of islands and never become an open ocean with vast expanses of water. The Hudson Bay area is the exception. Most of the uplands that are surrounded by these waters belong to the terrestrial Northern Arctic ecozone. The marine waters of the Arctic Archipelago ecozone include numerous channels, bays, straits, gulfs, sounds and fjords. The names of these places such as Norwegian Bay, Amundsen Gulf and McClintock Channel, reflect the rich history of exploration. In the more southerly waters, the area is largely ice-free during the two to three summer months, but north of Parry Channel, the sea ice often breaks up into massive fragments, but may only move around regionally. When the ice fractures in the summer, the patterns of ice leads and large floating fragments are dramatic. Dislodged sea ice can be driven by strong surface winds and be sandwiched into spectacular ice jams along the coastline. 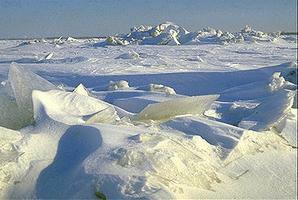 During the winter, the sea ice is largely continuous and land-fast. Some polynyas — open areas of up-welling waters — remain open throughout the winter. Like desert oases, these are biological hot spots in a sea of ice. There is generally high coastal relief in the east and low relief in the south and west. The climate is characterized by long, cold winters and short, cool summers. The short summer is enhanced by long periods of daylight. However, mean daily July temperatures tend to average only 10°C. Winter temperatures are variable, but with a mean hovering around -30°C. Locally intense use of this marine ecozone by migratory birds and marine mammals occurs during the summer ice-free period. This is a major feeding area for sea birds that nest on coastal cliffs and for waterfowl that inhabit coastal wetlands. Marine wildlife includes walrus and seals (ringed, harp and harbour). Like many other sea mammals, seals use arctic waters as calving and rearing areas. There are many types of whales: pods of the white whales (belugas), narwhals, killer whales, sperm and bowhead. Harvesting of both fish and marine mammals contributes significantly to the livelihood and culture of Aboriginal peoples. Arctic char is particularly important. Beluga and bowhead whales, walrus and seals support subsistence hunting. Marine waters are used to transport goods to northern settlements, and to ship ore, oil and other goods to more southern markets. This marine ecozone is the extension of the vast northern polar ice cap. 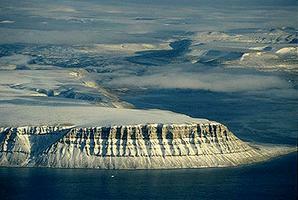 While it is formally part of the Arctic Ocean, it has a permanent cover of ice. The arctic sea ice rotates in a counter-clockwise, circumpolar gyre (i.e., giant surface current). Water depths are generally more than 2,000 m. The freshwater input from adjacent lands is low. The Mackenzie River discharge is perhaps the only significant exception. The presence of permanent sea ice over much of the area contributes significantly to the predominantly low biological productivity of this ecozone. The climate is dry and cold, with annual precipitation ranging from 100 to 200 mm. Mean daily January temperatures range from -30° to -35°C and summer mean daily temperatures are about 5°C. Overall, species numbers and diversity are low. The year-round ice cover creates desert-like conditions for most sea mammals. Typical species that tend to hug the margin of the permanent sea ice cover include polar bear, beluga whale, narwhal and seals (bearded and harp). The Bering Strait restricts water exchange between the Arctic and Pacific oceans. This restriction has contributed to the development of unique water properties in the Pacific, where temperatures and salinities are higher than in the Arctic Ocean. Seasonal ice at the northern boundary in the Bering Sea and in the Sea of Okhotsk further alters the water column properties and influences biota. Marine mammals unique to the ecozone within Canada include Steller Sea Lion and California sea lions, sea otters, northern fur seals, Dall's porpoise, white-sided dolphin and whales (giant, Stejneger's beaked, right, Pacific pilot and grey). Five species of anadromous salmon, Pacific herring, halibut and other groundfish form the backbone of the commercial fishery. This ecozone provides habitats within Canada for approximately 3,800 species of marine invertebrates, including more than 300 endemics, representing about 3.5 per cent of the world's invertebrates. Some examples of breeding bird populations unique to the ecozone within Canada include fork-tailed storm-petrels, Brandt's and pelagic cormorants, pigeon guillemot, marbled and ancient murrelets, Cassin's and rhinoceros auklets, and tufted and horned puffins. Forestry, fisheries, agriculture, transportation and urbanization in the Pacific Maritime ecozone have fuelled British Columbia’s economy for a century. In the process, these activities have altered many of the coastal areas. Urbanization and industrialization have introduced problems of pollution and siltation near the coast and many kilometres inland, affecting sea life. The alteration of freshwater courses and coastal areas and an expanding fishing industry have been other factors stressing marine ecosystems. Some fish such as the Salish sucker are on the endangered list. The abundance of other popular fish, like salmon and herring, have had marked shifts in numbers. Relentless trapping had completely extirpated the sea otter from the British Columbia coast by 1929. Reintroduction of the species has been successful, but it remains endangered. See also Endangered Animals, Endangered Plants. Tim Fitzharris and John Livingston, Canada: A Natural History (1988); R.D. 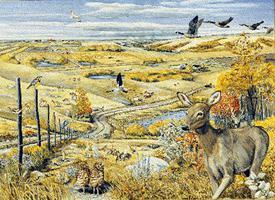 Lawrence, The Natural History of Canada (1988); J.S. Rowe, Forest Regions of Canada (1972); Clay Rubec, ed, Wetlands of Canada (1988 ); Ed Wiken, ed, Terrestrial Ecozones of Canada (1986); Steve Zoltia, ed, Eco-climatic Regions of Canada (1989); National Atlas of Canada(5th ed). Atlas of CanadaAccess a wide range of regional, national, and international online maps at this the National Resources Canada website. Canada’s ForestsKey facts about Canada's extensive forest regions from the National Research Council. EcoZones, EcoRegions, and EcoDistrictsDefinitions of ecological terminology from Agriculture and Agri-Food Canada. Canada’s EcozonesCharacteristics of ecozones in Canada from the Redpath Museum at McGill University. Northern Arctic EcozoneIllustrated description of the Northern Arctic Ecozone, the coldest and driest landscape in the Arctic. From the Canada’s Polar Environments website. A Perspective on Canada’s EcosystemsAn overview of Canada’s terrestrial and marine ecozones from the Canadian Council on Ecological Areas.